Attractive, compact little plants producing dozens of multi-coloured, seriously hot, miniature chillies. CAUTION: Can irritate eyes and skin. Wash hands after handling. Indoors, February to April. Sow the seeds indoors. Sow thinly, 0.5cm deep in small pots of seed compost. Water well and place in a light, warm position. Keep the compost moist. Get Growing: The seedlings should start to appear in 7-21 days. When your plants reach 5cm tall, carefully transplant them into individual pots to grow them on. 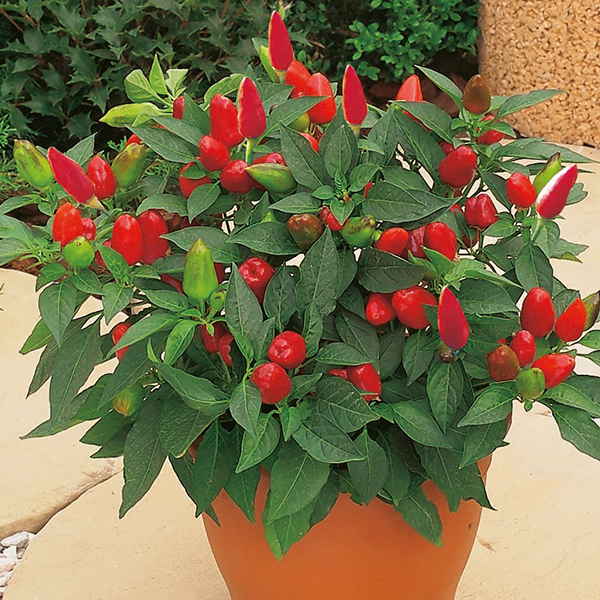 In late May or early June, put the pots outside for a few days to acclimatise to outside conditions (avoid late frosts), then plant out in their final positions, spacing them 45cm apart, or into large patio pots at least 30cm across and 30cm deep. Get Harvesting: The chillies should be ready to pick from July to October. The young yellow chillies are milder than mature red ones. For the best crops provide a regular liquid feed once the fruit begins to set.